As we launch into the first week of Fortnite Battle Pass Challenges for season 8, one of the first major challenges is to find three Fortnite giant faces located in three different biomes on the map. The challenge asks you to visit a giant face in the desert, the jungle and the snow, and all you need to do is land near them, in any order, to tick of this challenge and ear yourself five battle stars for your Fortnite funs. The Fortnite giant face in the desert is located to the south of Paradise Palms, on square E10 of the map. It's adorned on the side of the southmost rocky outcrop in that square, with a circle of cars making up its mad, funky hairdo. 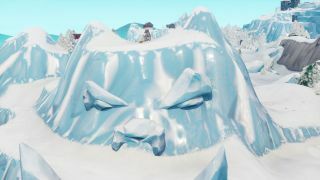 The little icy fellow that is the Fortnite giant face in the snow is located just to the East of Happy Hamlet, within E10. It's on the iced-up mountain with the face looking out to see with its back to Happy Hamlet itself. Over to the east of brand new location, Stunny Steps, is the third and final Fortnite giant face - this time of the jungle variety. It's suited on the tallest mountain there with a small temple on the top of his dome.